4.26 +/- acre Commercial Land for Sale located on Bell Drive right off Highway 99. Site has extreme visibility/frontage to over 61,000 (HWY 99) Cars per day. 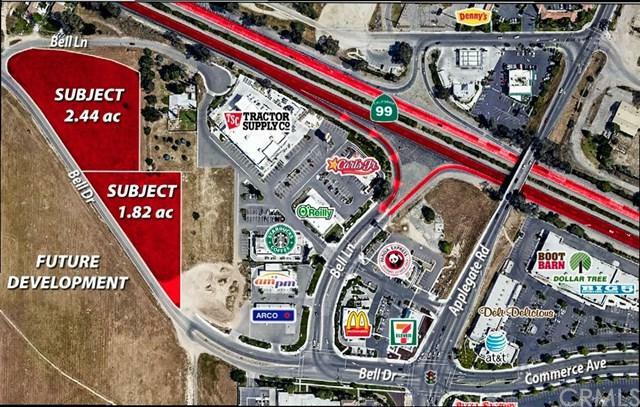 Site is located in immediate proximity to the Applegate Ranch Plaza over 452,000 sf of retail. Land has two APN 001-260-001 (2.44 acre) & 001-260-013 (1.82 acre) Nearby National retailers include Wal-Mart, Super Target, Tractor Supply, Marshall's, Dress Barn, Famous Footwear, Boot Barn and more.